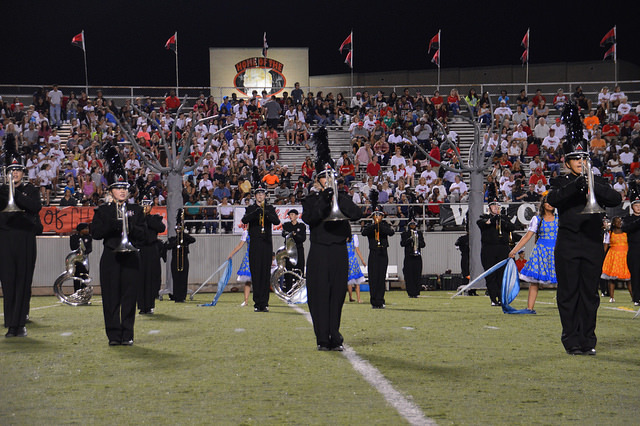 A busy week for the Wildcat Band Community, lots of activities included in this newsletter. The band is focused on preparing for its first competition while band parents are working on Homecoming activities. Our Meal and Chaperone Moms need parents to help serve meals, ride buses, and during the half-time show. To volunteer – click on the appropriate Signup Genus Link below. First Competition of the marching season – students must be at the band hall by 9:15 am. Parents – Join us at 11:45 am at the band hall to wish the band and color guard Good Luck in the first contest of the season! Come to the traditional Spirit Flag Send Off! Band departs at noon. The Wildcat Marching Band competition performance is at 3:15 pm. If you plan to attend the competition please join us by 2:30PM at the Midlothian Multi-Purpose Stadium at 1800 S. 14th St., Midlothian. Wear a spirit shirt or show shirt. When you arrive at the stadium look for the Wildcat band family, we’ll have our spirit flags! Help us support the band and color guard during their performance! The students love to hear shouts of encouragement from the stands! The admission fee for the event is $10 for adults, $5 for children 12 and under. After the competition preliminaries, the students have a short dinner break, and then finals which are followed by an awards ceremony. The Wildcat Band has worked hard since August, learning to march and then working tirelessly on the show. We encourage everyone to attend the competition. Watching the band perform and seeing the students’ excitement is an amazing experience. The band should arrive back at the band hall around 11:30 pm. Please be early to pick up your student. Should our travel plans change, we will provide an update on Facebook. Homecoming is three weeks away!! Mums and Armbands go on sale Thursday, September 29, 2016! We need parent volunteers to take orders during lunch at the LHHS, click here to sign up for a time slot. Due to student holiday on Friday, October 7 and Monday, October 10, students will have two fewer days in which to purchase mums and arms bands. Please remind your kids to purchase early due to the short selling time. Please submit completed forms and ad money by Monday, October 3, 2016. We need to allow time for the printed programs. For information, please contact Melanie Gilmore. If you are interested in purchasing an ad, click here to download the ad form. Thanks for supporting the band! The posters are located in the Band Hall on top of the piano. Please help us post the band posters through the community. For immediate updates, please check our Facebook group page, click here to join.